Team: Shree Kumar, Deepak Malani & Me. This has been one of my best adventure so far! On the road for 4 days… camping wherever you can! Here is the path and the gradient information. Yes! we did a LOT of climbing with good downhills! 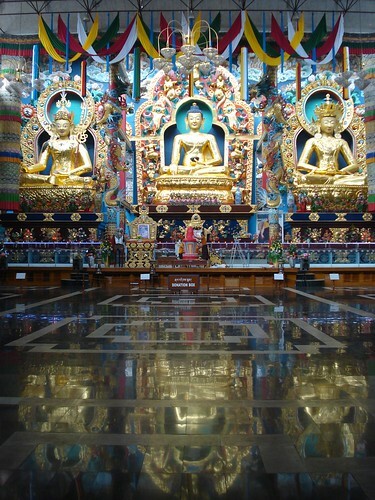 Before starting our journey we visited the golden temple of Coorg. 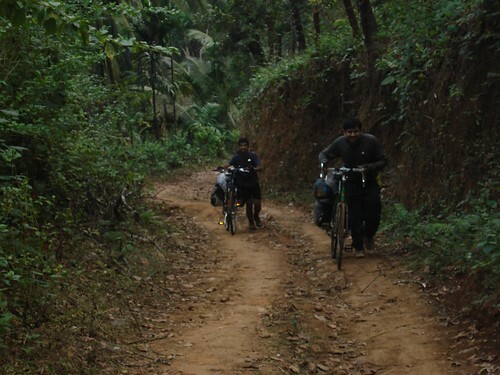 After this we reached Shree’s uncle’s place and started our biking journey. I was quite excited as it was the first time I was set out to do something like this. Now no turning back, 4 days on the road. 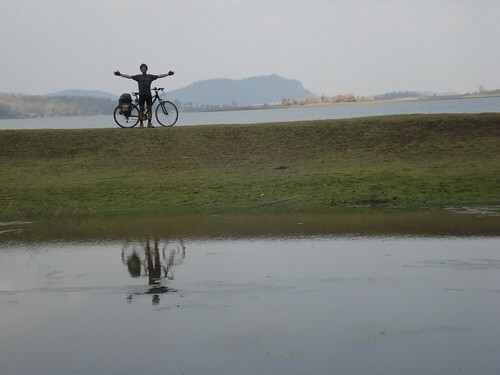 Our first day was completely on the back waters of Harangi dam. It was such breathtaking experience! 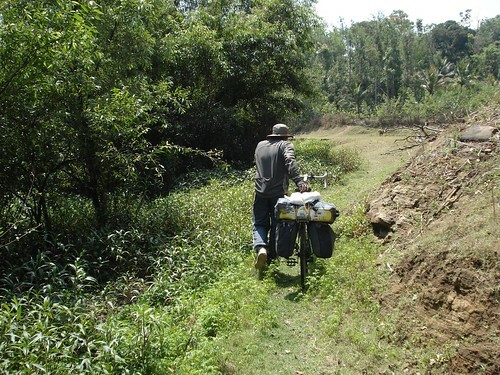 We cycled through some rough terrains. It was not about covering distance, but enjoying the view around us. No man-made things around us, just nature for as long as we went. 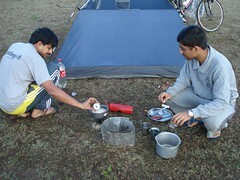 Finally end of the first day, we camped few KM before the Harangi dam. That night Deepak cooked a special dish made out of broken wheat called Dalia. 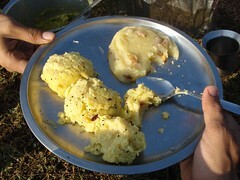 Next morning we woke up and had filter coffee, uppittu and kesaribath – courtesy Shree! 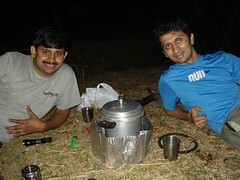 It was so amazing to have filter coffee and kesaribath in a forest! 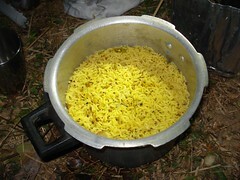 When I initially thought about this trip, I had only noodles and some ready to eat food in my mind. We ate and got ready and then I realized I had a flat tire. There was a bamboo thorn in my tire! I had recently replaced my tires with Continental touring plus which was supposed to be puncture resistant. I guess that explains how bad our first day terrain was! At around 4AM Shree woke up with lots of ant bites! 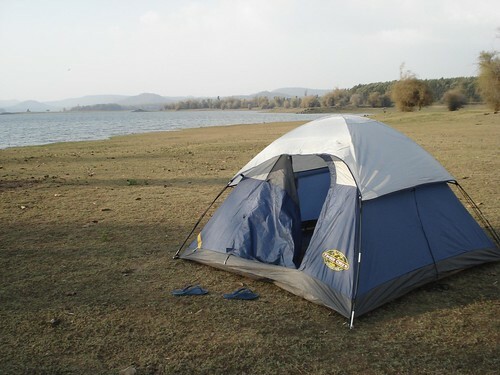 Yes… we realized our tent was under attack of the ants! We had to sacrifice a date fruit outside the tent and used lots and lots of AXE deodorant to get rid of the ants! 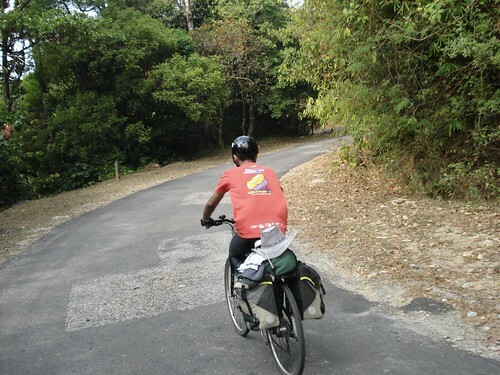 We covered some rough patch of road for the first half of the day and then traveled through different forest area. End of the journey we found the best water source in 3 days. It was right under a bridge and a flowing river! Needless to say we all jumped into water and had a lot of fun! We had a lot of distance to cover with some stretch of unknown road. We wanted to be back by 5PM so that we reach Bangalore by midnight. …after a lot of huffing and puffing, we saw a jeep come next to us. We asked the jeep guy how long does this road go like this? The jeep guy said for another 10KM! 😀 At this time I know we needed help. Shree quickly asked the jeep guy if he could get us through the climb. He finally did! Phew! This saved us a lot of time. Once we were on top, we still had a lot of distance to cover! 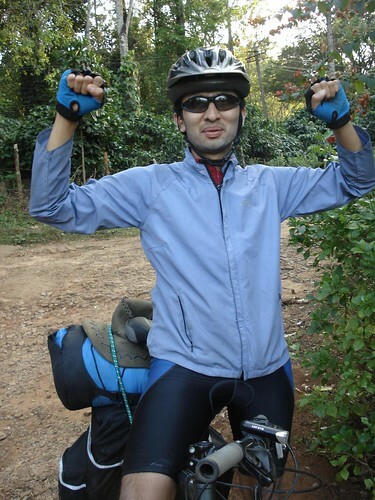 The last few KMS to Madikeri was again a bad climb. 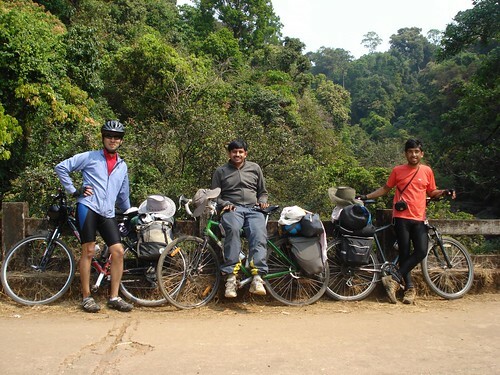 We took a nice lunch break at Madikeri and continued another 25KM to our destination! It felt real good to have completed the whole trip! This is really awesome! Must have enjoyed every bit of the trip. Great. 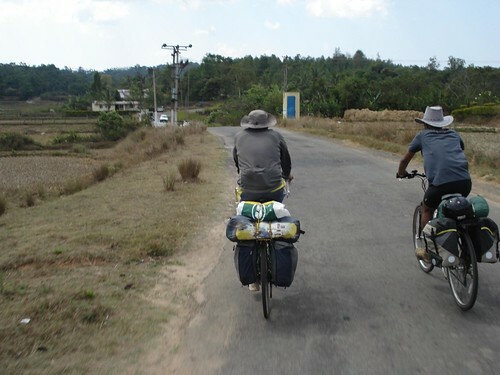 Very adventurous cycling tour indeed. Sweet dude! Looks like you guys had a lot of fun. And worked hard for it! But no gastronomic compromises, I see :). 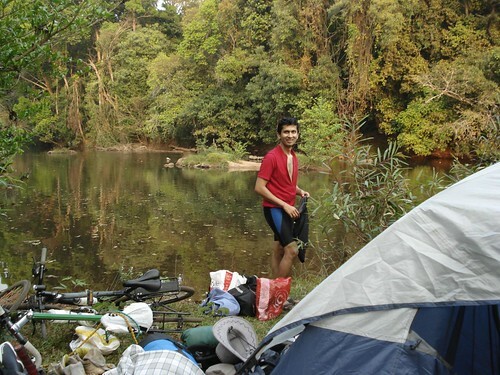 Hey Deepak the photos speak for the adventure you guys have had. I have been to this thodikana, i believe there is Mallikarjun Temple and a water falls called devara gundi there. AWESOME VIKRAM !!!! 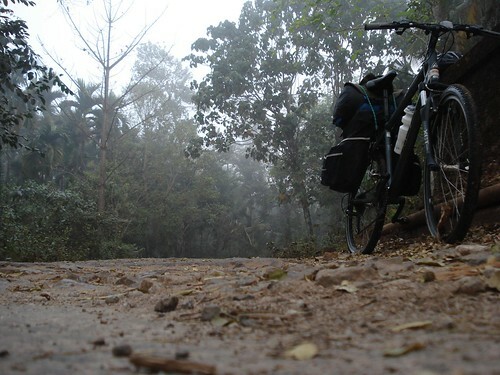 i aspire to go on such a trip with you … this is one super motivating blog entry buddy ! Next Next post: 102 Miles on a mountain bike!